Why does healthcare cost so much in the U.S.? Well, we typically rely less on hospital care and more on outpatient care than most countries, so you might expect that we pay less for hospital care and more for outpatient care. But you’d only be half right. 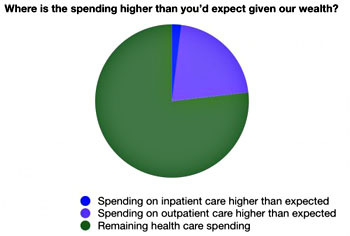 The fact that we’re spending so much on outpatient care isn’t necessarily a bad thing. Same day surgery does cost less in general that longer inpatient stays. But it’s undeniable that the incentives in the system to financially reward quicker and less invasive procedures have increased their use. The financial rewards are much more for outpatient than inpatient care, and the fee-for-service mechanisms of the US encourage the use of more care. ….So here’s our first bit of depressing news. The single biggest contributor to the money we’re spending that’s “extra” is for medical care. It’s not a company or a crook. It’s for actual stuff that we seem to value. I will get into some of the specifics of this in future posts, but the bottom line is that when we talk about cutting spending, we will need to talk about reducing this amount. Especially since, if we were spending so much on care, we should expect to see impressive returns in quality (which we don’t). The introduction to Aaron’s series on the cost of medical care is here, including links to each post in the series. It’ll be finished up on October 1.